Love Sriracha? Check Out These Fiery Sandwiches! Sriracha can provide such a rich, spicy flavor to your dishes. Try these siracha-fueled recipes and see what we mean! Since breakfast is said to be the most important meal of the day - why not make one dish that has everything you need to get your day started? 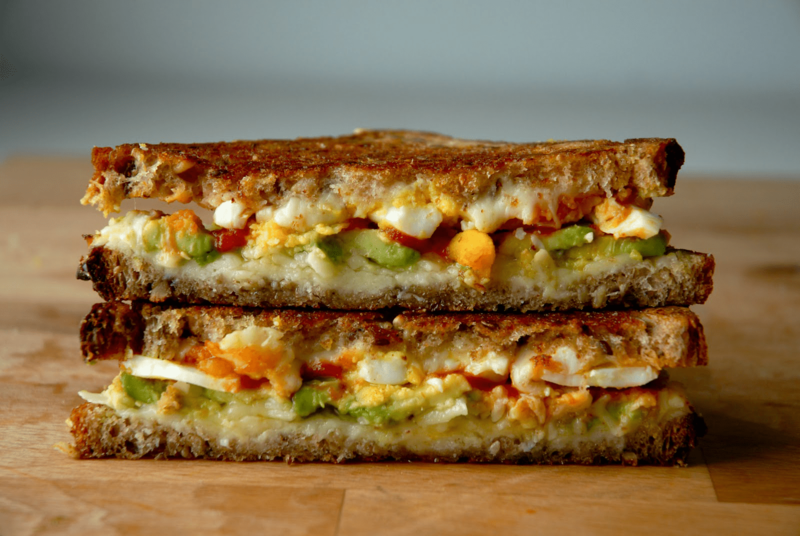 This Avocado and Medium Boiled Egg Grilled Cheese with Sriracha is the answer! A simpler version of this Thai Toast with Peanut Butter, Sriracha + Cilantro recipe originally appeared in Bon Appetit Magazine but has since been enhanced to add honey to balance out the savory and salty flavors! If you're unfamiliar with this type of breakfast, peanut butter toast is a simple and fast way to instantly get protein into your system and also helps boost low blood sugar levels. When Sriracha, lime juice, and cilantro are added, this open-faced Thai sandwich gets even more flavorful and much more exciting. Even though it sounds sort of strange, believe me, once you try this Thai Toast, you'll have a new go-to breakfast that's quick, easy and delicious. And best of all, it's good for you! This spicy Thai chicken salad is a great flavorful and healthy alternative to the typical heavy mayo-based chicken salad recipes. Packed with peanut-y awesomeness, the sesame peanut dressing is loaded with flavor and makes an amazing sauce for a guilt-free chicken wrap. The herbs bring an unexpected pop of freshness to the sandwich while the Sriracha adds a flair of spice. And if you don't like heat, leave off the Sriracha and chilis and add a splash of lime juice instead. This Banh Mi Sandwich with Cilantro Lamb Meatballs recipe is a spin on a banh mi sandwich and features herbaceous lamb meatballs, Sriracha, kewpie mayo, herbs, and pickled vegetable. Don't eat meat? Try using a soft boiled egg or some pan-fried tofu. This Curry Chicken Salad Sandwich robust and flavorful curry chicken salad sandwich is made with a mixture of greek yogurt and mayonnaise so it has a much lighter taste with more health benefits than your typical calorie packed chicken salad. Greek yogurt not only provides a nice tangy bite, but it's also full of probiotics and live cultures that help aid digestion and speed up metabolism. Bulgogi marinade, which is originally used in Korean Barbecue, works wonderfully to create a Brisket Bahn Mi Sandwich that's sweet and savory and full of flavor. Fresh herbs add an earthy kick, while quick pickled carrots and crispy cucumber cut through the fattiness of the meat and mayonnaise. In the ingredients following, I listed Kewpie Mayo because I think its texture works best for banh mi but feel free to use any mayo you have on hand. A good baguette is crucial to this awesome sandwich. Avocado toast is definitely a buzzfood these days. Sure, there are already hundreds of awesome variations out there all over the on the internet, but this Avocado and Egg toast is my all time favorite. Toasted sourdough, creamy avocado, a rich soft boiled egg, spicy Sriracha mayo, crisp slices of fresh radish, and bright ribbons of curled scallion come together to make this toast incredibly tasty and totally delicious.